Mojitos are the classic cocktail originating from Cuba. Now one of the most ordered cocktails. Shake up one of these refreshing drinks for your next get-together. Tear the mint sprigs and drop into a cocktail shaker. With a muddler, press the mint to release its flavors. Fill the shaker with ice. Measure in the rum, lime juice, and simple syrup. Cap and shake vigorously. Pour into a large glass. Top with soda water. *Simple Syrup- one cup sugar and one cup water brought to a boil and cooled – keep refrigerated for up to 1 month. © 2008 Kathy Casey Inc. This quick and easy mojito is made with my Dish D’Lish Mojito cocktail mix. You can substitute strawberry puree for the raspberry if desired. Squeeze & drop lime into cocktail shaker. Fill with ice. Add rum, Cocktailor and puree. The price of a plane ticket, hotel, and the dollar to euro conversion alone is reason enough to hang up a dream of a vacation in Paris. Sad, no? 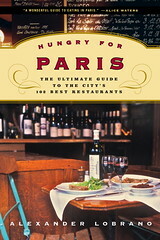 Instead, pick up an Edith Piaf CD, a nice bottle of Burgundy and cozy up with Alexander Lobrano’s new book, “Hungry for Paris: The Ultimate Guide to the City’s 102 Best Restaurants”. From the start, Lobrano has you hooked with the story of how he fell for the city and a life as a food writer. The European correspondent for Gourmet magazine asks you to consider him the good friend you need to navigate the city’s vast dining scene. He clears up any misconceptions right away with a chapter titled “The Happy Eater’s Almanac”, and, his reviews read like vignettes, with a synopsis at the close of what not to miss. In this charming collection he covers them all from intimate taverns to haute cuisine, seasonal eating to dining alone, leaving no culinary cobblestone unturned. If you live in the Seattle Area, you’re in luck, as Lobrano will be reading from his book at Janiuk Winery April 22. Today is the first show I am doing with KOMO radio station in Seattle. It will air live today at 4:14 pm pacific time and then will be repeated at 6:15. Lisa Brooks, Eric Slocum will be dishing it up with me today about the first of the season asparagus. I hope you enjoy my recipe for simple Warm Asparagus with Orange Balsamic Vinaigrette & Hazelnuts. It is quick, easy and d’lish! Also if you look in past blog recipe archives you will find a recipe for Asparagus, Boursin and Shrimp Brunch Scramble which would be so tasty for a weekend brunch. Enjoy! Whatever your cooking method, just plunging asparagus into boiling water, steaming, or grilling, be sure to cook it only until just tender. Wash asparagus and drain well. Snap off tough bottom ends and use in soup or compost. Grill, boil or steam asparagus until just tender. Meanwhile, in a medium bowl whisk together the orange zest and juice, balsamic vinegar, olive oil and Dijon mustard. Toss in the warm asparagus, coating well in the dressing, and season to taste with the salt and red pepper flakes. Place asparagus on a platter and pour over the remaining dressing. Sprinkle asparagus with the Parmesan and hazelnuts. Serve immediately. © 2008 Kathy Casey Inc.
I’m super excited. I love to dish about food, and I have a great list of topics lined up. You can catch all the recipes I discuss as well as added segment features on my blog every Thursday. Fun stuff! How exciting is it to have two Seattlites in the Pillsbury bake off? Did you know that there is a million bucks up for stake? Not to mention serious bragging rights. To enter the contest you had to use one Pillsbury product in conjunction with a sponsor’s product (Fisher nuts, Smucker’s jams, C&H sugar, etc). After the recipes are sorted through, 100 finalsit are flown to Dallas Texas for a live bake off! Super fun! Check out the Pilsbury.com to see the winner and her 1 million dollar recipe! So, I thought I would post about a basic meal staple for beginning cooks. Vinaigrette, no sweat! Contrary to the “standard” measurements for it — which, in my opinion, make the vinaigrette too oily for today’s palate — I prefer to use 1 part vinegar to 2 ½ to 3 parts oil. The vinegar and oil can be any kind. Other essentials are a dollop of Dijon mustard, a big pinch of kosher salt and some pepper. Those are the fundamentals, and from there you can get creative. Add a pinch of sugar or a drizzle of honey if you like it sweet. Add some garlic, lemon zest and a squeeze of citrus if you wish. Try adding grainy mustard, some chopped fresh herbs or a pinch of ground spice such as cumin or coriander; or some chipotle chili powder and lime juice for a Latin influence. If Greek is your gig for the evening, then use lemon juice and olive oil, toss in feta cheese, fresh oregano and chopped olives. Italian? Balsamic or red wine vinegar and extra-virgin olive oil, fresh basil, garlic, a dash of grated parmesan. For an Asian style dressing go with rice wine vinegar, mild flavored canola oil and a dash of sesame oil, along with honey, toasted sesame seeds, fresh ginger and hot chili paste. You get the picture. Start with the basics and twist them to your taste. I have prepared a handy recipe that you can use as your vinaigrette guide to get you started. With a small wire whisk, in a small bowl, whisk together your acid component, Dijon mustard and salt. Then slowly whisk in the oil, adding it in a thin drizzle. This technique is to emulsify (make smooth and combined) your dressing. Then add your flavoring components. Chef’s Notes: You can keep the vinaigrette refrigerated for up to two weeks. Whisk up well before each use, and toss with your favorite greens. Experiment with different flavorings and combinations for your vinaigrette. Also, try out various greens and salad additions, such as nuts, fruits, cheeses, meats and seafood. Ginger-Wasabi Raita Dip – big flavor….guilt free! I love this Asian twist to the Indian yogurt dip, raita. You can use whole-milk plain yogurt, but if you are watching your waistline, then use low-fat or fat-free plain yogurt or a combination of that and fat-free quark. I have added spicy wasabi, fresh ginger and grated cucumber. I like to serve this dip with veggies such as bell peppers and carrots or rice crackers for a big-flavor guilt-free snack. It is also great as a topper to grilled fish or chicken. Be sure the liquid from the cucumber is squeezed out well. In a medium bowl, mix wasabi powder and water to make a paste. Mix in yogurt, then squeezed cucumber. Stir in ginger, salt, sugar, green onions and cilantro.Transfer to a serving bowl, sprinkle dip with red peppers for garnish, and surround with dip-ables of your choice.